The intro requires d3dx9_37.dll (IIRC), and a HD resolution (1280*720 or 1920*1080). If your display does not support it, try to add as a custom resolution in the NVidia Control Panel. wtf? All I got was cubes like the ones in the screenshot, but only ever on the right half of the screen. It didn't look like a bug too.. strange! psonice: encountered the same problem on ATI cards, I'll fix that in the final version. not as spectacular as most of the other 4k's from NVScene, but nice to watch and with great music. Nice cubes. I really loved (part of) the synth. Yes, cubes <3. But the presentation didn't convince me somehow. Sounds and look realy good! works fine as a 4k,but the renderstyle (lightsourced,one colour per side of cube) doesnt let me thumb it up somehow. added on the 2008-08-28 11:27:36 by ɧ4ɾɗվ. Crash, because of the res maybe. 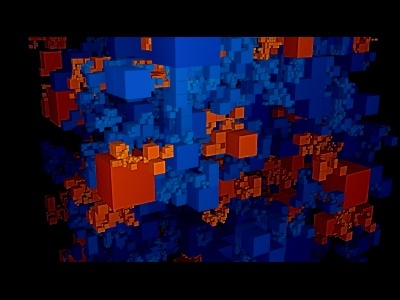 From the video, it may be just flat cubes but they are really nicely displayed. Nice cubes nice tune. cubes and synth are good. Nice formulas and clone expressions. Cubes done in a good way. I agree with optima - the music almost gets annoying in spots (for me, it was that cheepcheepcheep crunchy noise that almost but not quite grated on my nerves). That said, the visuals more than made up for it. Nice 4k, with nice music! Such a simple and pretty idea, and really well executed. One of my compo favourites. That is a really fresh sounding synth for a 4k! The graphics could have used some shadows or (SS)AO to give it more depth. page created in 0.016252 seconds with 15 queries.